Through out the ages of collectable gaming there has always been the "accessory"�. Accessories are defined as items that are nonessential but desirable, in that they contribute to effect or result. We have just seen our first official accessory release in the Valkyrie dice and dice bags included with the Flag Bearers. But we've had non-official accessories floating around for some time now. Last Saturday was a monumental event for HeroScape and its fans! It marked what heroscapers.com is dubbing: National HeroScape Day. Players from all over the nation gathered together on Oct. 21st and played at HeroScape tournaments in several locations. The day was given a sense of legitimacy by being backed with prize support from Hasbro itself. Hasbro sent out multiple tower sets to many of the event coordinators. The events were also supported by House Mouse Games with $50 gift certificates to several of the largest events. THANKYOU HOUSE MOUSE GAMES AND HASBRO!!!!! Dallas boasted 38 players and a prize table that would make any heroscape fan giddy. Well, its happened. Flag Bearers are poping up in Toys R Us stores nation wide. A couple of Heroscapers have snagged the swag. One of those heroscapers, Riggler, snapped us some photos. I paid $70.15 for all five. Einar: With the special powers of Hatamoto Taro and the Valkyrie dice, your Einar Samurai and Ashiguru will get an extra shield for each Einar symbol you roll. use the Valkyrie dice in normal combat (counting only skulls or shields), or as described on Hatamoto Taro's Army Card. Jandar: Sir Gilbert may give your Jandar-led figures an extra attack die. The Valkyrie dice may move them an extra space for each Valkyrie symbol you roll! Use the Valkyrie dice in normal combat (counting only skulls or shields), or as described on Sir Gilbert's Army Card. I'm kicking off a Heroscapers exclusive Wallpapers section in the downloads area. 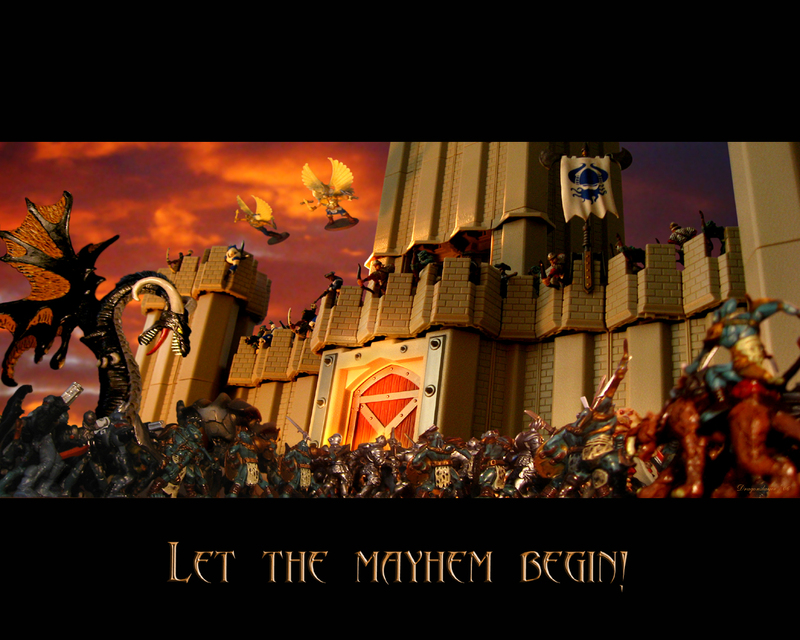 Kicking off the collection is Dragonslayer with the debut of his goregous work of art: Let The Mayhem Begin! And Mayhem it was! It took DS 50 hours from start to finish to shoot this one photo! The photoshop file, to build it, dove 29 layers deep! If the photo looks familiar, that's because it is. It's a live set-up of the box art from the Tower Expansion Set. You can check out Dragonslayers heroscape photography in his MOAM (Mother of All Maps) Thread in the forums section.